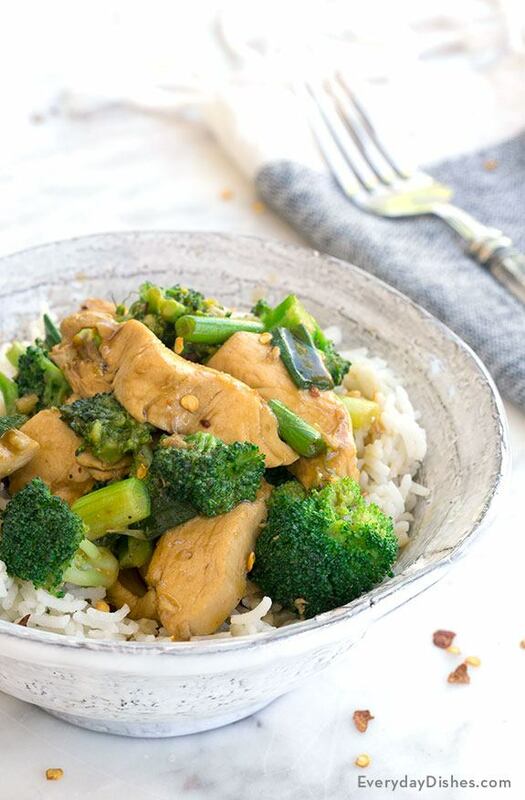 This chicken and broccoli stir-fry recipe is better than the dish from your favorite Chinese restaurant. Fresh broccoli and the savory chicken make for a healthy weeknight meal. Marinate then poach the chicken so it retains the tender texture typically only found restaurant-style. Be sure to slice the chicken very thin so it cooks quickly and evenly. As for the veggies, don’t worry about cooking the broccoli in the water for only 30 seconds. The veggies continue to steam once transferred to the sauce! 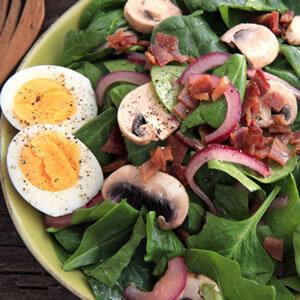 This is a great recipe to keep in the rotation because it’s fresh and easy. Use leftover chicken or steak and just throw in some fresh veggies. Slice chicken into thin strips then place in a large mixing bowl. Add egg white, 1 Tbsp oil, 1 Tbsp cornstarch, 2 tsp rice vinegar and ¼ tsp salt then mix until completely combined—each piece of chicken should be coated. Place in refrigerator to let marinate for 30 minutes—but no longer. While the chicken marinates, combine all sauce ingredients in a small bowl then whisk until cornstarch is completely dissolved. Set aside. Fill a large pot half-full of water then bring to boil over high heat. When the water reaches a rolling boil, add broccoli florets then let them cook for 30 seconds. Remove broccoli from water with a slotted spoon, reserving the broccoli and leaving the water in the pot. Reduce heat to medium-low then keep the water at a simmer until the chicken has finished marinating. After 30 minutes, remove chicken from refrigerator then carefully add it to the simmering water, stirring constantly to prevent sticking. Let the chicken cook in the water for 30 seconds to 1 minute—until it turns completely white. Drain chicken into colander then set aside. Collect the chicken, broccoli, sauce and all remaining ingredients then prepare to assemble each plate. Begin with placing a large skillet over medium-high heat then adding oil. When the oil is hot, add the garlic and cook for 15–20 seconds—until just barely browned—then immediately add chicken and begin to stir-fry until chicken is re-heated and cooked through. Pour sauce mixture into the skillet and stir to coat. Let sauce thicken and come to a bubble, then reduce heat to medium-low, stirring constantly. Let sauce simmer for 1 minute then stir in broccoli and sliced green onion. Toss to combine and continue cooking until broccoli reaches desired tenderness—if sauce becomes too thick, just add a small amount of water to thin. Remove from heat and serve piping hot over fresh steamed rice or noodles. Enjoy! Chicken tenderloins are inexpensive and easy to prepare—they cook quickly which makes them perfect for stir-fry!